The attractive hamlet of Kirksanton is clustered around the village green and is dominated by the presence of Black Combe, one of The Lake District’s smaller mountains. It comprises of a collection of cottages , farms, village hall, a former brewery and a few grander houses. The village pub is now The King Billy Grill well known for good steaks and home cooked food. It is mentioned in The Doomsday Book and has a long history. It is home to The Giant’s Grave, two prehistoric standing stones. Located on the top of Lacra, a hill behind the village, are two small stone circles. Manor Farm is located down a quiet lane which ends at a small bridge over the river Lazy [known locally here as Kirksanton Pool ]. 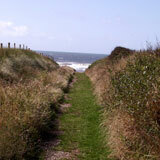 A track continues over the bridge to a farm and on to the beach which runs from Haverigg to Silecroft . At low tide a long expanse of firm sand is exposed with small rock pools ; a great place to spend endless hours or to watch the spectacular sunsets over the Irish Sea and the Isle of Man. There is a children’s playground on the village green. Due to our position on a narrow coastal plain next to a mountain we benefit from our own micro climate. 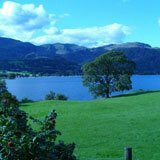 It may be raining or even snowing in the rest of the Lake District whilst we are enjoying sunshine ! So don’t always believe the weather forcast. There is a great variety of wild life in the immediate area. This includes roe deer, foxes, badgers, hares, stoats and wild mink. Herons, buzzards, skylarks, lapwings and curlews are common. We are also home to barn owls, tawney owls and nesting swans. At the farm we have provided nesting / roosting spots for swallows, bats, owls and kestrels. We are on the migratory bird route and in spring and autumn rush out to watch the wild geese flying in formation over the farmhouse roof !